The Marlborough bedroom range is a high quality collection of pieces crafted from solid American oak finished with a beautiful waxed finish. The combination wardrobe has a classic look, fitting perfectly into a variety of bedrooms. This combination wardrobe is an ideal storage solution for your bedroom, giving you both hanging and folded space. Utilise the bottom of your wardrobe as storage with accessories and shoes. 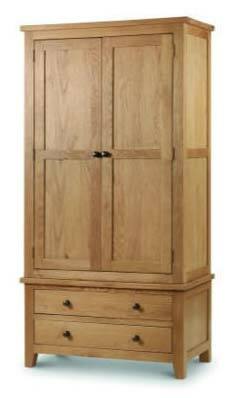 The Marlborough wardrobe has been constructed from solid American oak which gives it an instant high quality look. Finished with a smooth waxed finish, emphasising the beautiful natural wood grain. This wardrobe has a classic style with a versatile finish making it the perfect piece to coordinate perfectly in many different bedroom settings. This wardrobe is constructed from solid American oak and finished with a warm waxed coating to protect the surface and accentuate the natural wood grain. The wardrobes back panel is thick plywood. Complete with contemporary round metal handles. As this is a larger item self-assembly is required. We would recommend two people for the assembly process. Answer from LucyConway Hi, Sadly we do not provide a self assembly service, however instructions are included with the product. Thank You, Lucy.